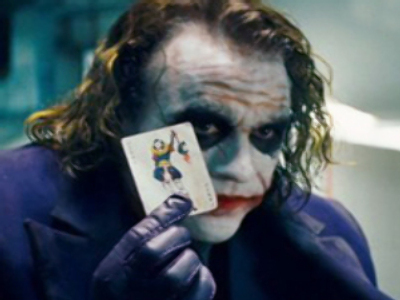 Joker copycats raise panic in U.S. The threats were later traced to two teenage boys who allegedly wrote them after being inspired by “The Dark Knight”. In the movie the anarchist Joker portrayed by Heath Ledger instils mass panic in the fictional Gotham City by a series of terror attacks. Justin Dirico and Bryan Stafford, both aged 18, were arrested on Tuesday by the police and charged with conspiracy to commit an act of terror. The felony carries a maximum sentence of 20 years behind the bars, reports ABC News. Police say the two have confessed to leaving the threatening cards in public places. But police chef J.C. Martin defended the charge, citing the severity of public alarm it caused. The boys are now waiting for trial after been released on bail.